As the still distant rumblings of thunder grew louder, she scuttled across the creaky 100-year old floorboards to bolt shut a window that had been flapping in the breeze. Just in time. The first drops had started to fall, and they were soon cascading across the glass panes blurring her view of the world outside. She had arrived one day earlier at this desolate cottage, perched high atop a cliff overlooking the Atlantic Ocean. Though the air had been dry when they unloaded their luggage yesterday, the sun was nowhere in sight. And it seemed as if the grey horizon was no strange guest to the villagers. Regardless, they emanated a warmth and openness that seemed contradictory to their inclement weather when they greeted this group of foreign misfits. Weathered skin stretched taut as they beamed with congenial hospitality. Their eyes sparkled with curiosity as they asked the travelers what had brought them to the end of the Earth. And they glowed with pride as they recited their culture and history. Now, her companions were out exploring the endless beach, strewn with all kinds of treasures from the deep: hollowed out mussels, dismembered crab shells, bits of rope, empty bottles, and other signs of a life beyond the aquatic that had somehow managed to find their way ashore. She had chosen to stay back and explore whatever secrets this cottage might hold. The kitchen, no bigger than her bathroom back home, was littered with tiny tin boxes. Some empty, some filled with relics: from whom or when completely unknown. She sifted through them marveling at rusty coins, loose buttons, shards of porcelain that someone had probably intended to piece back together. Bits of lives long forgotten and stowed away in a kitchen, up on a hill, in a cottage by the sea. The wind whistled as it blew across the chimney top and turned it into a makeshift flute that played back the harmonies of the gales outside. The rain had picked up and was beating an offbeat percussion as it lashed across the glass. The cottage though, centuries-old stones painstakingly stacked atop each other, showed no signs of relenting to the whims of mother nature. She felt safe within its walls, protected, like all the little fragments hidden in the nooks, crannies and tin boxes. She shuffled back to the window, the yarn of her woolen socks snagging on the splintered floors. Her friends were nowhere in sight. Knowing them, they had sought refuge in some creperie and were huddled around a bottle of fizzy cider. As her stomach grumbled, she started regretting her choice to stay behind. There was nothing more than stale baguette and coffee in the cupboards. And the storm outside showed no sign of subsiding. She looked to the bookshelf, jam-packed with haphazardly piled volumes, for a distraction. Everything was in French. She was scanning the titles and authors for something familiar when her eyes caught a leather-bound edition of Emila Zola’s Au Bonheur des Dammes. This was the first book she had read by Zola. And though she wouldn’t be able to understand a word of it in French, she wedged it out and carefully turned back the cover to reveal the crumbling yellowed pages. She ran a finger across the letters spelling out a story she knew. The all too common tragedy of people reduced to poverty as big business rendered them and their livelihoods obsolete. She was absentmindedly flipping through the pages, glossing over them for familiar words, when a page fell loose. It, too, threatened to disintegrate as it hit the floor. As she picked it up, clasping one of the crumbling corners between index finger and thumb, she realized it was not a page from the book, but rather a hand-written note. The ink had also succumbed to the passing of time. Not that she would have understood it either way. But as she held it in her hand, she thought again about the scraps of life that had found a home in this cottage. She thought about the people who had come before her and those that would come after her. She thought about the remnants of a life left behind that seemed so precious to those who had held on to them, and were yet so easily tucked away in tin caskets once they were gone. 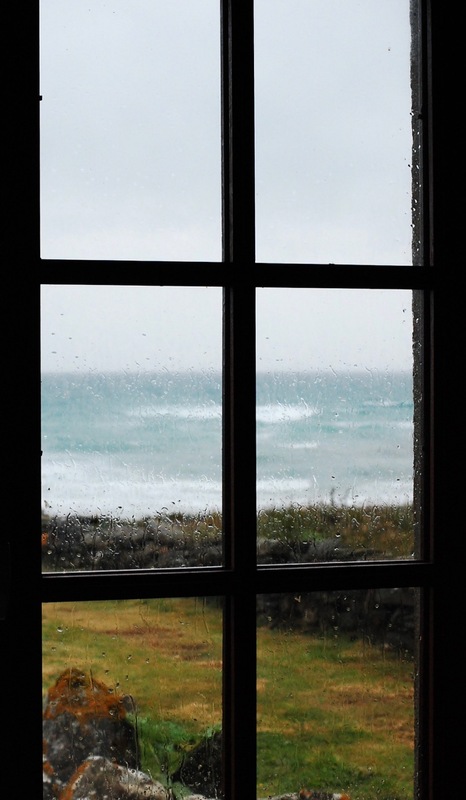 She sat down by the window to watch the only thing that would outlive them all, that mighty tempestuous sea. When her friends came crashing back into the cottage, raucous from a jaunt in the fresh air and lightheaded from something a bit stronger than cider, they found her sliding a book back onto the shelf. As she turned towards them to quiz them about their exploits, she silently slipped a pen back into an open drawer before closing it shut. One day, another soul hoping to discover some lost mystery might come across this story and try to piece together a life in a cottage, atop a hill, at the edge of the sea. He later learned that this was why the fishermen called her La Mar. Men were predictable, transparent, straightforward. There was no mystery hidden in their depths. No concealed threats. But the sea. No. She was a woman. If she just turned around she could be a part of it all. But she was frozen. Trapped in the safety of echoes and reflections. Nothing could harm her here. Thrust into this new existence in a rural backwater surprisingly close to the allegorical Siberia, he realized how remote his new world was, and that perhaps the vast Siberian emptiness was not overly metaphorized after all. It was an emotional lifetime ago that he had last set foot there. Would he recognize anyone? Would they recognize him? Every mile closer brought with it a nagging feeling. Why had life led him to an ordinary woman who was leading him back to this forgotten ordinary world? She sifted through them marveling at rusty coins, loose buttons, shards of porcelain that someone had probably intended to piece back together. Bits of lives long forgotten and stowed away in a kitchen, up on a hill, in a cottage by the sea.